Over the past year or so I have often enjoyed my conversations with Sledge, the Territory Wars officer in my Guild and one of the leaders of The Empire Alliance, an alliance of 9 drama-free guilds that can serve and guide players of all types in SWGoH. I have often been impressed with his theory crafting, his strategic thinking for Grand Arena and Territory War match-ups and his knack for accurately predicting what is to come in Galaxy of Heroes. In fact, he has often predicted items I knew about from the GameChangers program that I wan never able to verify given the NDA that I signed with Electronic Arts. If I had to describe these moments I would say this – “Impressive. Most Impressive.” As a result I have asked him to start a new monthly The (Probably) Road Ahead column for Gaming-fans.com with the first edition below. A lot has happened since my first article. We did get Darth Revan, which completely changed the landscape of arena, so there’s one for me. CG, however, misled a lot of people, myself included, about the effectiveness of the General Grievous rework (they stated his team would “exceed people’s expectations”), so I count that as a partial loss. The droids were, as expected, completely worthless against Traya so I give half a point on that grade! I have been delayed in writing this one because so much has been happening the last couple weeks, I wanted to let the dust settle before taking people down a new path. First, the B2 login toon. What does this mean? Well, I think the most likely scenario is that we will be getting a new Clone Wars era TB map, with separatist droids needed for the SM to get Padme shards. We’re going to see a lot of Clone Wars content in the near future and I believe this will be the lynchpin of all of it. That being said I have not changed my mind on the Malevolence being a new capital ship. A somewhat less-likely option is a separatist legendary to get Padme. Considering when the new droids will go f2p farmable, this seems much less likely. All the same, we should be farming them as soon as they hit the ground. This all being the case, CG is not ENTIRELY done with Old Republic content just yet. Darth Malak has yet to be added to SWGoH. Possibilities for his release (in order of likelihood) are: a) Guild Events Currency toon, b) new type of legendary requiring Sith Ships or c) marquee/chase event. Being a KOTOR fan, Malak is much more important than a run-of-the-mill marquee, and he should be on the level of Traya as far as event importance goes. This is particularly true with the buildup CG has given Malak with the final cutscene from the Revan journey event. With CG experimenting with new release types, I find a Marquee, or even a Marquee plus event very unlikely. A less likely scenario for the near future is some sort of event involving the Ebon Hawk to get a Sith Empire capital ship. Is it possible? Yes. Is it likely? I highly doubt it. All of this said, my recommendations for farming remain unchanged. Get those Sith ships, and Anakin’s starfighter farmed up, and fast. Be ready to farm Palpatine’s shuttle and the droids as soon as they drop. And most importantly, once you are done building your new arena teams, SAVE YOUR GEAR. May the 4th is coming in less than a month and CG is going to do their best to drain our wallets. On the raid front, we are closing in on being due for a new raid. I think CG has learned their lesson on creating raids that facilitate infinite loops, but they have painted themselves into such a small corner with all of these new turn meter manipulation kits that I simply do not believe they will be able to create a more difficult squad raid (at least for now) without making it exceedingly boring. It is for this reason I believe the next raid will be ship-based (like the Death Star Raid we first mentioned in December 2016). This has been discussed on multiple occasions, and with the advent of a fifth capital ship on the horizon, I find this to be a much more likely scenario. There is a lot more untapped income for CG in making people invest in non-arena ships than there is in beating a dead horse with squads that are already geared for many many people. Long term, last time I noted that we would see either Galactic Republic, or Jedi Luke replace the Darth Revan meta (which had not yet been revealed). Given the Clone Wars era content coming this month, this leads me to believe we will get that Galactic Republic content now, that it will therefore not be arena-meta level content, and that we should be looking for Jedi Luke to finally upset the Old Republic apple cart to take over the meta later this year. For my own part, I have farmed every existing rebel (yes, even Lobot), and even Ugnaught to seven stars just in case CG attempts to throw us for a loop when that event comes. We should expect it to look like something completely new. It would otherwise be far too formulaic to produce any real income for them. What serious player does not already have a G11/12 CLS, Raid Han, Chewie, C3PO, and R2 with most of the zetas? With Padme on the horizon, we can expect to finally get a maskless Darth Vader sometime within the next year. Speaking for myself, I will be background gearing Anakin, Ahsoka, and the Clones, plus finishing the farming of all the minor Clone Wars Jedi to be as prepared as possible for that day. 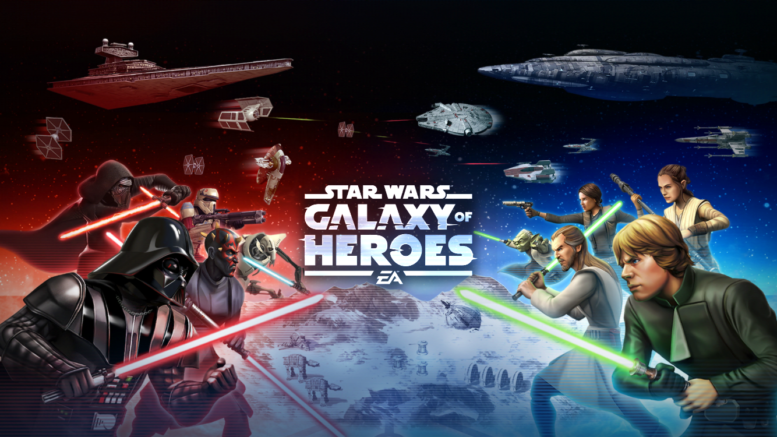 Be the first to comment on "SWGoH: The (Probably) Road Ahead – 04.06.19"